Pelvic floor physical therapists are trained to apply varying techniques of internal (vaginal or rectal) and external manual therapy, otherwise known as myofascial release or soft tissue mobilization. These techniques include correcting pelvic obliquities, reducing muscle spasms, decreasing pain, ‘breaking down’ scar tissue and reducing adhesions, all with the purpose of improving tissue mobility and function. These techniques are essential in relieving pelvic pain. WHO CAN BENEFIT FROM MANUAL THERAPY? In general, a patient with pelvic pain will benefit from manual therapy to restore normal tone and function to the pelvic floor muscles. Muscles that are ‘hypertonic’ will have adapted to a shortened position over time or from a direct trauma resulting in the inability to relax and contract through the normal length-tension ratio they were designed to. 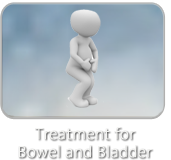 Restoring muscle balance will allow for proper contraction and relaxation of the pelvic floor muscles and coordination with the bowel and bladder.